The filament jammed in the feeder and wouldn't budge, so I undid the feeder and just want to make sure I have all the internal components in their correct positions before I put it back together. Looks right to me, assuming you have the Bowden collet and clip somewhere handy. I suggest that you print out Robert's feeder as soon as possible. Jams are impossible, it's easier to clean, and you can service it without the feeder stepper falling off the back. I did print it out a few weeks ago, I was just hesitant to put it together as I'm scared I'll screw something up and put my printer out of commission. If you already have the stock feeder in bits I'd say it's too late to be nervous! - after all, what would be stopping you putting the stock feeder back if Robert's feeder didn't work out? I was looking at Robert's post on youimagine site and I still see people talking about it jamming. Maybe it's only a few out of the majority but I'm one of those, "If it isn't broke, don't fix it" kind of people. Since I got mine working again, I'll print out Robert's Version 6 feeder, but I don't see the point in installing it if the stock one is working. Especially since this is my first jam in over 250+ hours of printing. On another note, I did the Atomic method for the first time, man that works really well. Actually, the stock feeder is broke, which is why Robert's redesign is so popular. Also, the only way Robert's feeder can jam is if you wind up the spring tension too high. OTOH the ability to more easily adjust tension is another of its strengths. There's a good discussion of the various designs in the mods forum. Though it occurs to me that by "jam" you may be referring to grinding and underextrusion in general. Those can happen for lots of reasons, regardless of the feeder, but Robert's feeder doesn't make the problem worse. I would like to contradict that the feeder is broken. There may be room for improvement, but in my opinion that goes for everything in life. I mean.. the hot end can probably be improved, but so can the chair I am sitting on or the door handle that is on the office door. The fact that there is room for improvement, doesn't mean it is 'broke'. Since the launch there have been some improvements made to narrow the room for improvement within the current design. Personally, on the Ultimaker on my desk i also have Roberts feeder, I installed it to test it out and I was quite pleased with the result. I know plenty of people, like tinydancer, who have a great experience with the feeder. 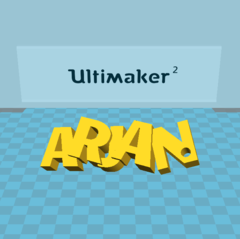 I also wanted to contribute in adding the manual for the Ultimaker 2. 1) no access to any of the sharp and hurtfull bits of the feeder. you don't want such a thing readily accessible when you have little kids running around.. or actually, even yourself if you are not paying attention.. i almost got some skin caught in between my non-default feeder.. the default design is a safe design. 2)the situations where the default feeder is just not working as well as is to be expected, is more due to the way the spool is connected by default, then by the feeder itself. i kept having underextrusion issues when i was reaching the last 10 percent of the spool of filament. once i switched to a system where the default feeder was in a straight line between the spool and the bowden tube, using UltiArjans rail system, i had almost no under extrusion again. there is also an issue with the pinned wheel not aligned with the filament in a lot of cases. it seems the little screw gets a bit "loose" during transport, allowing the pinned wheel to wiggle around. this cause the feeder to loose grip on the filament. yes, the feeder from UltiArjan and Rober is performing way better than the default feeder in certain circumstances. yes I believe there is certainly room for improvement for the default feeder but if you look at the design and the constraints a company has to work with (i don't believe Robert's feeder would pass a safety inspection) I think they did quite well. [*]guaranteed to accumulate debris inside with no easy way to clean. [*]no way to partially open it for cleaning - the same four screws that hold on the cover also hold the feeder motor. [*]once the thing is apart you need three or four hands to put it back together. IMHO, these are serious errors. I don't really buy the safety argument - it's a small knurled wheel moving quite slowly. However you could always fit an external cover, maybe held in place with velcro. I definitively agree with DonMilne on his points 2-4. That's why I'm also a conviced user of Robert's design. The reasons why I exchanged it were mainly points 2 and 3. However, I'm aware of the fact that UM cannot declare their own feeder as bad. And without depreciating Robert's work: his design is actually based on the UM design of the Original model. And now it's jammed again. I was able to take it apart and remove the jammed filament and get everything working again, but now it seems to be under-extruding. I'm actually trying to print out Robert's latest feeder, but it starts laying down the bottom layer and then seems to not get enough filament on the bed. Here's a pic, this is my 3rd attempt now. In between attempts 1 and 2 I leveled the bed and did the atomic clean. Material is black PLA/PHA from colorfabb. Where should the little white slider be on the feeder? I put it back to approx. where I had it before but maybe the tension is incorrect. Any help would be appreciated, this has been quite frustrating. Update: And now it's not even getting enough material out of the nozzel on the initial extrusion that happens in the corner of the buildplate. It has to be the feeder. How does the filament come out when you do Move Material from the maintenance menu? If you're under-extruding i would advise the clean the nozzle more, do the atomic method with some clear filament (to see the burned PLA that comes out). Once it comes out without anything, you can assume it's clean. The stock feeder does a good job i think, so it should print fine without changing it. I like Robert's feeder too (i use it for several months now) mainly because you can open it easily. From your pictures i think you have to level the bed a bit closer to the head, it also looks like you have some adhesion issues, maybe apply some glue (apply it evenly with a wet cloth). It looks like the bed is sloping slightly, the top bit (in the picture) is just a tad too close and the nozzle might even be bottoming out on the glass plate. If so this problem should correct itself on later layers - so don't be too quick to abort the print. I might also raise the nozzle temp by 5C to aid extrusion. When I heatup the nozzle and try to move material, it just makes a clicking sound from the feeder so it's not the bed. If you look in the picture, clearly material is not coming out in parts, which makes sense given that moving material doesn't work. I'll try the atomic method some more, but I don't have clear filament. I'll use a different colour though so I can be sure. One question I have about bed leveling is how much resistance should be in place when I level using the piece of paper? The clicking sound is the feeder motor failiing to turn to the next step, because the torque requirement is too high, because of high back pressure. That could definitely be caused by the bed partially blocking the nozzle, so don't dismiss that idea. It could also be be caused by a nozzle being blocked internally by something that doesn't want to melt (have you been using ABS? - anyway the Atomic method shld fix that), or a faulty temperature sensor not letting the hotend get hot enough. ColorFabb is a good brand, so it probably isn't the filament being too big, and a newish role too? So I doubt it's friction in the Bowden tube.